Well, obviously, the peaches here are not local. BUT I shall be visiting Atlanta sometime in September, and if I am lucky, there will still be good peaches there! Well, Victoria, I've never had a Georgia peach so you must report back! 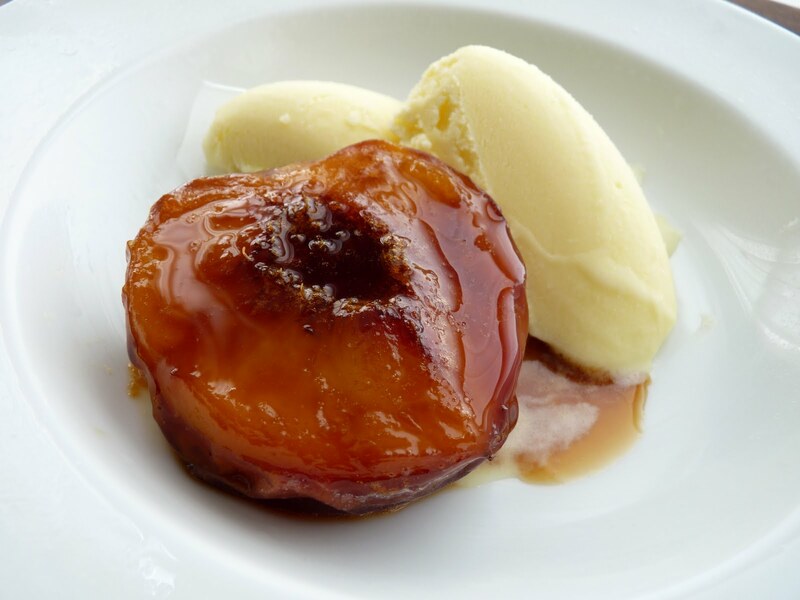 It's amazing how addictive roasted fruit with caramelized sauces can be. Having tried some of these, I find it hard to move on and use the fruit for other desserts! This recipe is something I will certainly try sometime, the peach season in India is just over. Organic Massachusetts peaches are due in Maine soon through our organic produce buying organization Crown of Maine and when I buy my usual 2 cases I'll have to try roasting some!! Two cases? 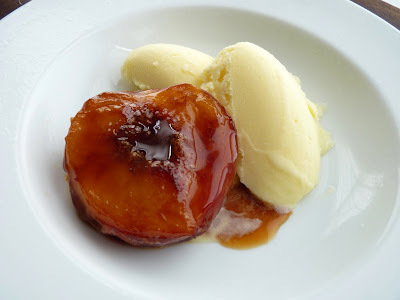 well yes, there's jam to make of course, but nothing brightens up our long winters better than a bowl of home prepared fresh thawed sliced peaches in light syrup...sunshine in a bowl.....as to the ice cream, I can live without it. Sujata, I am in perfect agreement about roasted fruit. It really concentrates the flavor. I bet you have lovely fruit in India. OhEss, AH! To have 2 cases of peaches. How wonderful. Enjoy your jams and slices throughout the year. I think you'd love them roasted, too. 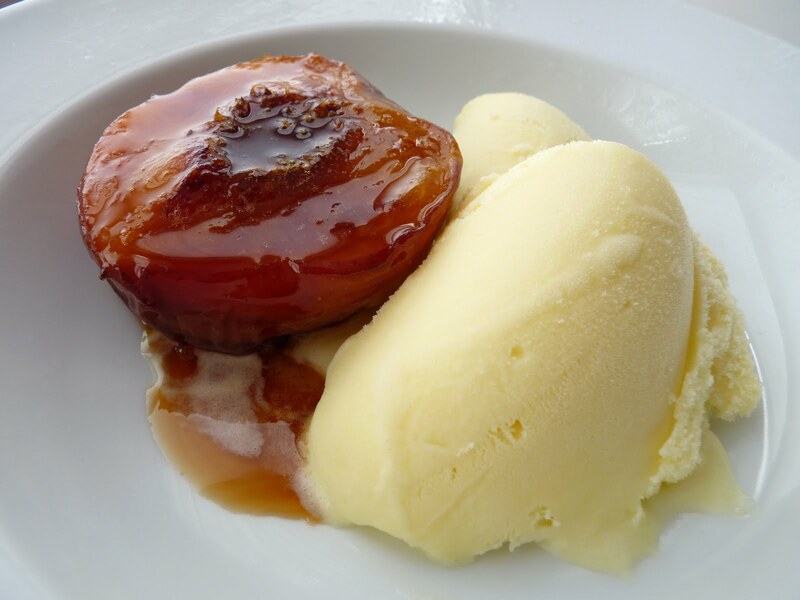 Desserts are made for the people who are not satisfied in what they eat. It is one of my favorite dish. Desserts can be an ice cream, cakes, chocolates, or any sweets. The only thing that is important is you enjoy eating. Peach season is coming to an end. My Whole Foods still has them, and I was pondering what to make. This recipe is a show-stopper. I love your bench notes, and I think they are all worthy tips. Bookmarked! roasted/grilled fruit is really the best way to go. have you ever tried grilled pineapple? so tasty. 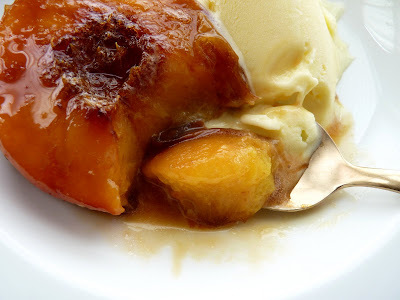 I love the look of this - I roasted some peaches recently with an amaretti crumble inside, but I reckon this would be even better. They look so sticky and caramelly and delicious. This looks so summery and fresh! The pictures are gorgeous. Those gorgeous peaches. So sweet. My chef was right when he said we eat, first, with our eyes.